WebIsADb is a publicly available database containing more than 400 million hypernymy relations we extracted from the CommonCrawl web corpus. This collection of relations represents a rich source of knowledge and may be useful for many researchers. We offer the tuple dataset for public download and an application programming interface to help other researchers programmatically query the database. WebIsADb is now available as a LOD endpoint. S. Faralli and S. P. Ponzetto. 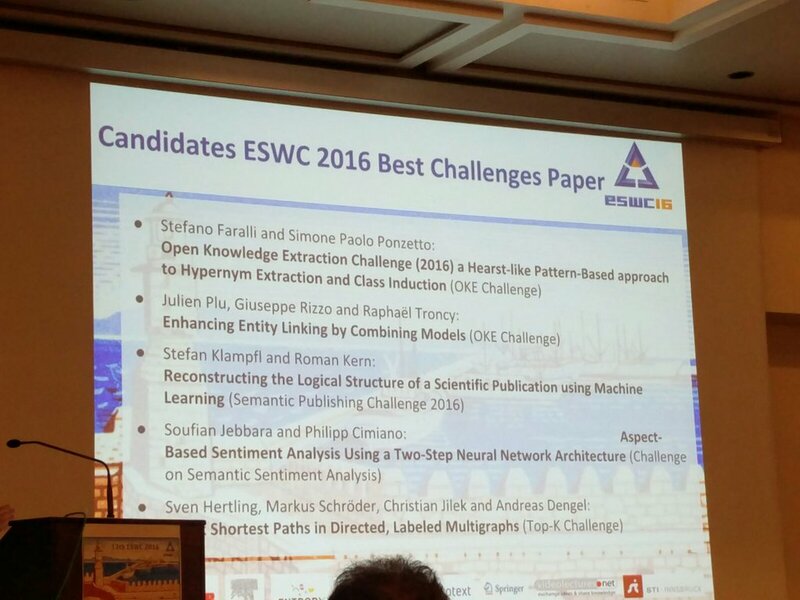 DWS at the 2016 Open Knowledge Extraction Challenge: A Hearst-like Pattern-Based Approach to Hypernym Extraction and Class Induction. 2016-01-01: A paper about the WebIsADb was accepted at LREC 2016 . Julian Seitner, Christian Bizer, Kai Eckert, Stefano Faralli, Robert Meusel, Heiko Paulheim and Simone Paolo Ponzetto, 2016. 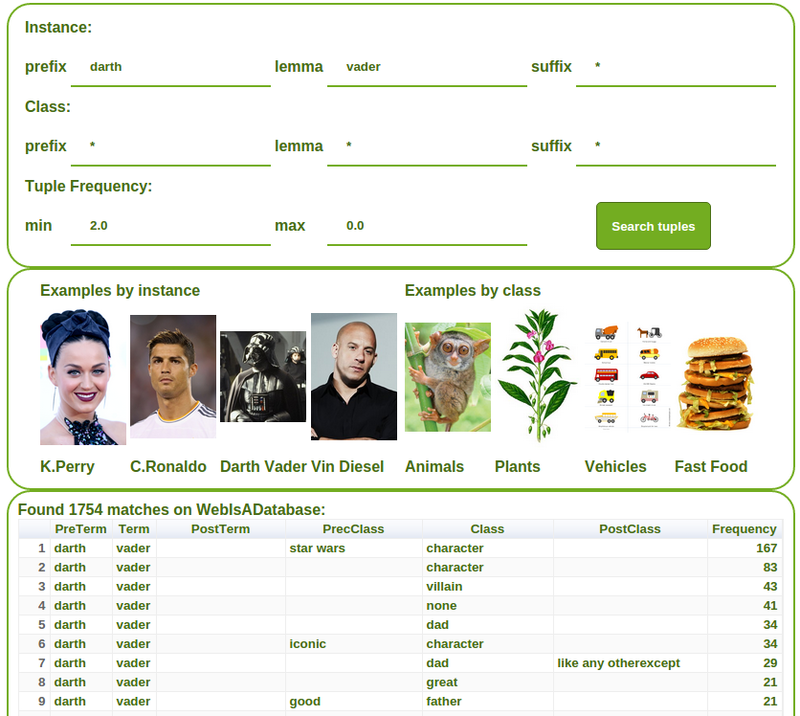 A Large Database of Hypernymy Relations Extracted from the Web. Proceedings of the 10th edition of the Language Resources and Evaluation Conference. Portorož, Slovenia. the number of resulting matches. To store and access all the extracted relations we created a MongoDB database. To have a direct look at the WebIsA database, a demo Web application is also avaliable here (see Figure 1). Figure 1: A screenshot of the Web application. The database consists of two MongoDB database instances: the first collecting the "isa" tuples (but not the metadata corresponding to the extraction contexts) and the second the extraction contexts (i.e. the pay-level domains and the sentences from where a tuple was extracted). The two database can be separately downloaded and instantiated in the same or in two different machines. Download and install the MongoDB server (we recommend the installation of the version v3.0.7) on your machine/machines please follow the instructions reported at the official guide Install MongoDB. To instanciate our dumps on your target MongoDB servers, please follow the instructions reported at the official guide Restore a MongoDB database. Our suggestion is to use the "mongorestore" tools by passing as <path to the backup> argument the path to the folders "tuples-webisadb-april-2016" and "contexts-webisadb-april-2016" of the uncompressed dumps for tuples and contexts respectively. the first line of the csv files contains a comma separated list of the fields name i.e "_id,instance,class,frequency,pidspread,pldspread,modifications". frequency: the frequency of the "isa" relation "(ipremod +"aang"+ipostmod, cpremod+"character"+cpostmod)"
provids: a semicolon separeted list of contexts id, one can use to retrive te whole context of the extractions (e.g. including the context identifier "383416952", one can use to serach the corresponding context in the resource described in the next paragraph). the first line of the csv files contains a comma separated list of the fields name i.e "_id,provid,sentence,pld". "93459608,383416952,"This application has this option included too. Movie and TV series feature such characters as Aang, Prince Zuko, Katara, Sokka, Uncle Iroh, Commander Zhao, Fire Lord Ozai, Princess Yue, Katara's Grandma, Master Pakku, Monk Gyatso, Azula, Old Man in Temple, Zhao's Assistant, Earthbending Father. ",appszoom.com"
The above package includes: a "readme.txt" with the instruction to configure the API and the "apidocs". Examples are also included in the main method of the file: "src/de/unima/webtuples/WebIsADb.java"
The above package requires the CommonCrawl framework and can be used to re-build a new WebIsADb from fresh CommonCrawl dumps. Feel free to cite one or more of the following papers depending on what you are using. Stefano Faralli, Christian Bizer, Kai Eckert, Robert Meusel and Simone Paolo Ponzetto. A Repository of Taxonomic Relations from the Web. Proceedings of the 15th International Semantic Web Conference (Posters & Demos) 2016. The WebIsADb and the API are licensed under a Creative Commons Attribution-Non Commercial-Share Alike 3.0 License. This work was partially funded by the Deutsche Forschungsgemeinschaft within the JOIN-T project (research grant PO 1900/1-1). Part of the computational resources used for this work were provide by an Amazon AWS in Education Grant award.